Today’s “Card of the Day” features an unconfirmed king of britain (and some beautiful SGR)! [AUTO](VC/RC) Generation Break (1):When this unit attacks a vanguard, this unit gets [Power]+4000 until end of that battle. [AUTO](VC/RC) Unite (This ability is active if you have called two or more cards to (RC) or (GC) during this turn):When your other unit is placed on (RC), this unit gets [Power]+1000 until end of turn. 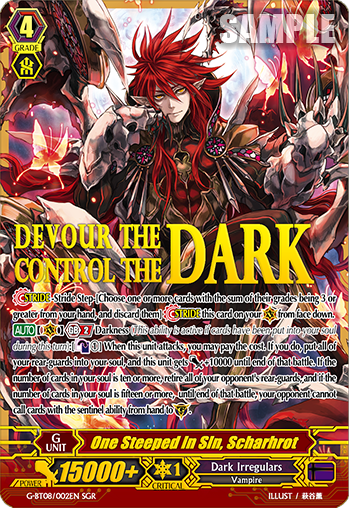 [CONT](VC) Generation Break (2):Your rear-guards’ revelation ability changes to “[AUTO]:When this unit is placed on (RC), look at two cards from the top of your deck, search for up to one card from among them, put it into your soul, and put the rest on top of your deck in any order.”. [ACT](VC):[Counter Blast (1) & Soul Blast (1)] You may draw a card. If you do not, put up to one card from the top of your deck into your soul, choose one of your rear-guards, and that unit and this unit get [Power]+3000 until end of turn. [AUTO](VC) Generation Break (2) Darkness (This ability is active if cards have been put into your soul during this turn):[Counter Blast (1)] When this unit attacks, you may pay the cost. If you do, put all of your rear-guards into your soul, and this unit gets [Power]+10000 until end of battle. If the number of cards in your soul is ten or more, retire all of your opponent’s rear-guards, and if the number of cards in your soul is fifteen or more, until end of that battle, your opponent cannot call cards with the sentinel ability from hand to (GC).